Unfortunately for Big Blue, 2014 feels a lot like 2013. No one predicted an 0-6 start last year and we dug ourselves too big of a hole to climb out of, despite playing better in the 2nd half of the season. After losing yesterday to the Cardinals (against a QB who hasn’t played in 4 years), the Giants are standing on the edge again, one step away from falling into yet another hole too big to recover from. Yesterday’s loss was especially frustrating because we made the same mistakes that we have consistently made since the start of last season. Drew Stanton did lead his team down the field on the opening drive of the game but the Giants beat themselves yesterday. Turnovers, poor execution and special teams cost us the game and allowed Arizona to score 15 unanswered points in the 4th quarter. Our offense has a lot of stuff it needs to work out and I understand that it takes time with a new coordinator and a new system. Play will improve but it’s tough to fall to 0-2 in a game that you should have won. A great 90-yard drive to take the lead in the the 3rd quarter, only to give up a punt return and turn the ball over in the 4th. Turnovers have been the achilles heel of this team for some time now and until that gets remedied, we can’t expect to be legitimate contenders. Newly acquired defensive back Walter Thurmond was also lost for the season with a torn pectoral. A huge blow to what was supposed to be a revamped secondary. Finally, the most frustrating thing about yesterday’s loss was that the team faced adversity, appeared to overcome it, only to squander the chance to win late. Having a lead late in the 3rd quarter, I was confident that we had righted the ship and we were going to find a way to win. But instead the Giants handed the game to the Cardinals. 0-2 is very different than 1-1 and when you look around the league, there are teams who faced the same adversity against tougher opponents and found ways to win. The Chargers lost to Arizona in Week 1 and faced the defending Super Bowl Champs in Week 2. Philip Rivers led his team and found a way to win against a quality opponent to avoid falling to 0-2. The same goes for the Packers who fell behind 21-3 in their home opener after losing Week 1. Rodgers led his team back and pulled out a win. Chicago is another example of a team that lost in Week 1 and faced major adversity in Week 2 (trailing 17-0 in the 2nd half against a good team in their first game at a new stadium). Yet, Jay Cutler flipped a switch and the defense continued to make plays to lead the Bears to a hard fought win. Finally, even in our division, the Cowboys and Redskins both had bounce back victories (even after RGIII went down with a gruesome ankle injury). They found ways to win and they didn’t beat themselves. That’s something I thought that the Giants would do too, especially against a back-up QB. If any team knows the perils of starting off super slow, it’s this one yet we didn’t do enough yesterday. It’s possible that those teams are just better than us this year and that’s why they were able to come out with W’s. I don’t want to believe that just yet though. There’s still plenty of football left to be played and although the result was not there this week, that doesn’t mean the season is lost. We have a tough game against the 2-0 Texans this week and we need to bounce back. This team desperately needs some confidence and something to build upon – a win over Houston would be just that. If we have a chance to compete for the NFC East, this is the week we need to prove it. Hopefully Tom Coughlin has the team ready to play smart, turnover-free football. Eli played well enough yesterday and if he can continue to acclimate himself to the new offense, then I think the Gmen have a lot of potential. 0-2 is not quite 0-6 but we’re headed in that direction. This is the week to change all of that. Because if it doesn’t happen now, then when we are finally ready to play good football, it will be too late. Week 3 is often the week that new systems begin to take hold as well. 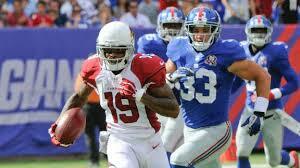 We saw it in 2007 with Steve Spagnulo’s defense and hopefully we will see it in 2014 with Ben McAdoo’s new offense. Although yesterday was frustrating, it’s only two games. We’ve got 14 left and I know that we can be a playoff team and I hope we can show the rest of the league that fact on Sunday.